The S&P 500, Dow Jones industrial average and Nasdaq all tumble for a variety of reasons. NEW YORK — A late slump left U.S. stocks mostly lower Wednesday. Apple climbed after a solid quarterly report and a forecast for strong iPhone sales. Brewer Molson Coors suffered its biggest one-day loss in 13 years after it said the U.S. beer industry got off to a slow start in 2018. Weak results from drugmaker Gilead Sciences and animal health company Zoetis weighed on health care companies. Smaller companies fared better. Apple did a bit better than Wall Street expected in its latest quarter and forecast better sales than investors feared. The tech giant also said it will spend some of its tax savings on a $100 billion stock repurchase. The S&P 500 index fell 19.13 points, or 0.7 percent, to 2,635.67. The Dow Jones industrial average lost 174.07 points, or 0.7 percent, to 23,924.98. The Nasdaq composite slid 29.81 points, or 0.4 percent, to 7,100.90. 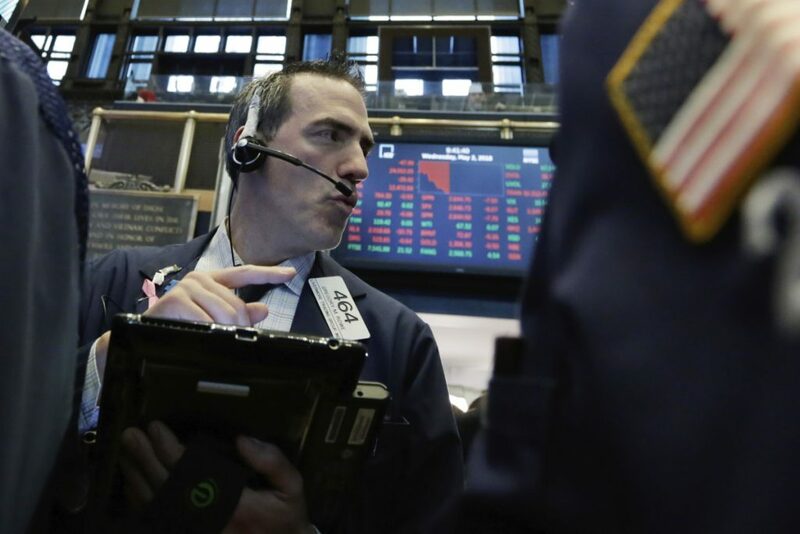 The Russell 2000 index of smaller-company stocks added 4.58 points, or 0.3 percent, to 1,554.92 as smaller technology companies and retailers advanced. After months of concerns on Wall Street about weak iPhone sales, Apple had a slightly better fiscal second quarter than expected and investors were pleased with its projections for the current quarter as well. It’s also giving its shareholders a lot of cash. Apple bought back almost $23 billion in stock in the first three months of the year and will spend another $100 billion on stock repurchases. It’s also raising its dividend. The Republican-backed tax package temporarily lowered the taxes that companies pay when they bring cash stashed overseas back to the U.S., which encouraged companies like Apple to bring that cash back to the U.S. Apple stock climbed 4.4 percent to $176.57. The bond market had little reaction to the Fed’s statement Wednesday that it is leaving its benchmark short-term rate at between 1.5 percent and 1.75 percent, and bond prices were little changed. The yield on the 10-year Treasury note remained at 2.97 percent. The dollar weakened and fell to 109.73 yen from 109.81 yen. The euro fell to $1.1988 from $1.1993. Molson Coors Brewing said cold weather may have prompted consumers to cut back on their drinking. The company’s results fell short of analyst projections and it also said sales to wholesalers declined. Its stock shed 15.4 percent to $60.64. Coca-Cola and Pepsi continued to fall, with Coke down 1.2 percent to $42.06 and Pepsi sliding 1.9 percent to $97.23. Xerox’s CEO and most of its board will resign as investors Carl Icahn and Darwin Deason push the company to stop its sale to longtime partner Fujifilm. The duo called for Jacobson to resign in late January, shortly before Xerox announced a deal that will result in Fujifilm taking majority control of Xerox. Jacobson and five other directors are being replaced. Xerox said the new board will reconsider the deal with Fujifilm and could terminate or restructure Xerox’s relationship with the company. Xerox shares fell 9 percent to $29.38. Snap skidded 21.9 percent to $11.03 after its first-quarter revenue fell far short of estimates. The company said its redesign, which some users have slammed, was one of the reasons for the slip. Benchmark U.S. crude jumped 1 percent to $67.93 a barrel in New York, while Brent crude, the international standard, rose 0.3 percent to $73.36 per barrel in London.